Packaged clover honey at a hotel's in-house breakfast buffet. I was spending a weekend at a hotel in Kansas City, Missouri - well, Kansas, actually, just over the border - for a friend's son's wedding. The hotel was chosen because it was within 10 miles of all of the wedding-related venues - rehearsal dinner, wedding, wedding reception and bride and groom's new home. It was a great opportunity to reconnect with friends I had not seen in awhile as well as a chance to meet my friend's family. As we settled in for breakfast, I spotted the honey package on the buffet and helped myself to one. It was honey made in USA so I was reasonably assured it was real honey. I wondered in passing if Pooh Bear wondered if the honey he found was also real. Although I try to stay away from applying heat to honey so that the beneficial enzymes in honey remain, it was the perfect addition to my lemon tea after a long day of parties and chaufferring. I'm sure Winnie the Pooh would have approved. Bluebird Gardens honey is just as it comes out of the hive. Actually, the labels include which hive. In this case, it's bees from Mildred hive, named after my grandmother. It was harvested by hand June 23, 2012. It hasn't been mixed or had artificial flavorings added. If honey gets cloudy, put in warm water to clear. 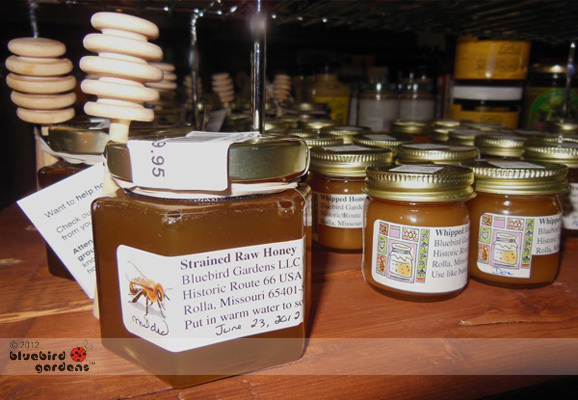 No need to refrigerate, honey can last literally for centuries. 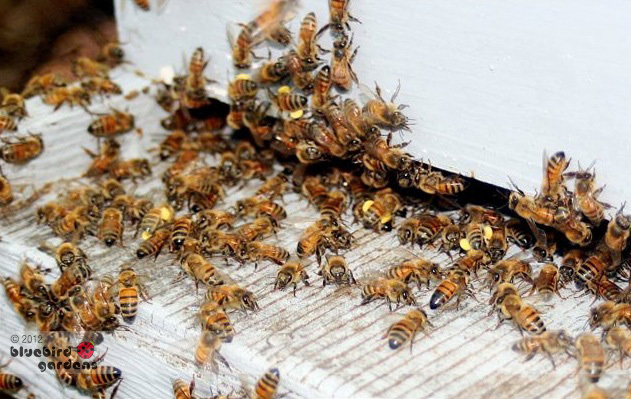 Once comb is filled with nectar and dehydrated to 18%, the oldest bees cap cells with wax. Bees make honey to give them food through winter. 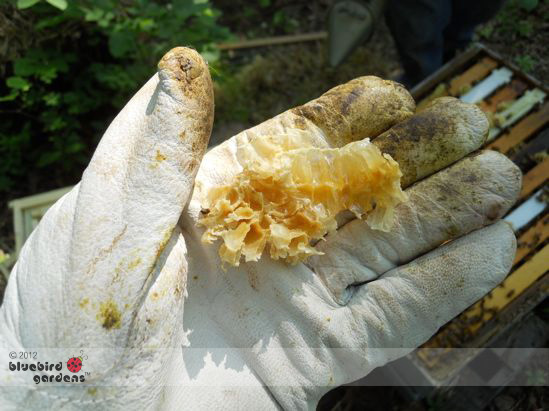 When they need to eat, they chew through wax caps to get to the stored honey. Melted wax caps become those highly-prized for a variety of home and beauty products including clean-burning beeswax candles. It's the new display at Route 66 Farmer's Market in Cuba, Missouri for Bluebird Gardens honey. Kelly Stroh does a nice job with her signs. The two top honey jars are by a local potter. Drive into Cuba, MO and you'll see the farmer's market on the left, right after a car wash. It's amazing to think something half an inch long and maybe 1/4 inch wide is responsible for every third bite we eat. 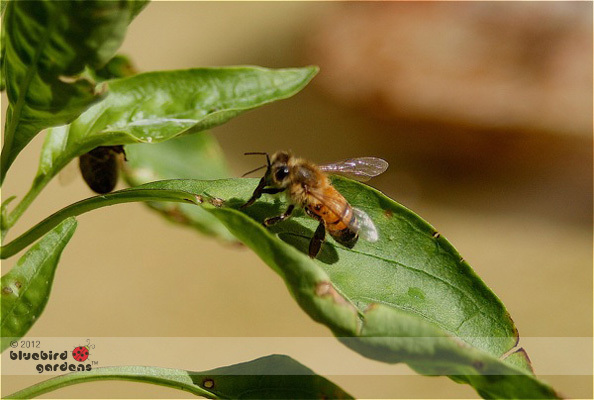 Honeybees are small but very sophisticated. Scientists continue to study how these tiny creatures live together in colonies of 40,000, dividing labor and easily adjusting to different chores when needed. 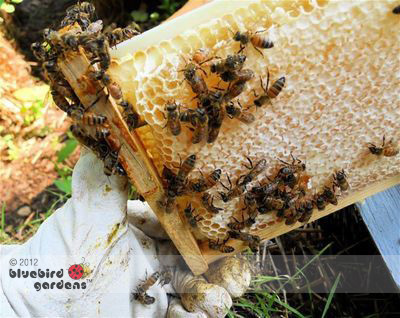 During their lifetime, they can produce food for new bees; wax comb where honey is stored; generate a wax-like substance from tree sap that wards off hive diseases, and royal jelly, which changes a bee into a queen. They also keep my garden growing by pollinating flowers, especially blue ones. With honeybees, size really doesn't matter. 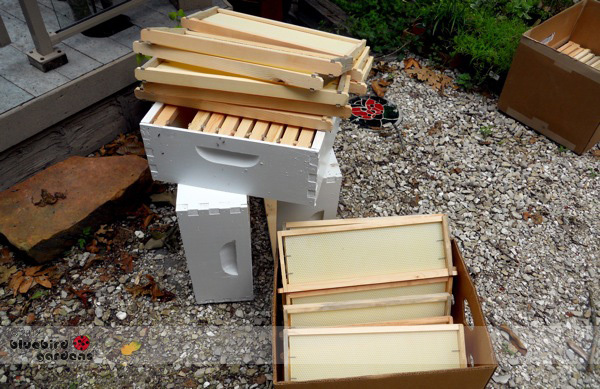 My bees were locally-raised and bred to be tame and good honey producers. Although they are very tame, people still have some reticence to be around them so I use a garden flag to warn visitors they are approaching the apiary, or bee yard. It took me a long time to find this little garden flag. For some reason, most artists draw bees as male. As soon as I get an indelible marker, I'm adding long eyelashes so it looks more like a "she." Most bees are female. 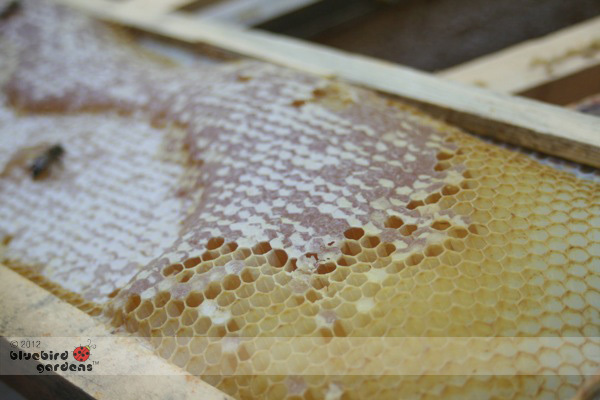 Can You Still Use Chrystallized Honey? There's nothing wrong with honey that has turned cloudy and become thick. To return crystallized honey to liquid form, place honey container in hot water for 5-7 minutes. Be careful of how hot you get the water; it can destroy some of honey's natural antioxidants. Do not heat honey in the microwave because it alters the honey taste. It only takes a few minutes for honey to turn back into its original liquid form so every couple of minutes pull it out of the water to see if it's liquified. This is burr comb, a glue like substance honeybees use to seal up bee hives. It's covered in fresh honey but I'll get to that in a minute. When I spotted this honeybee drone appearing to be broken in half in front of Gertrude, one of my two honeybee hives, I was worried.